Information about the Storm Water Management office of the Engineering Division. 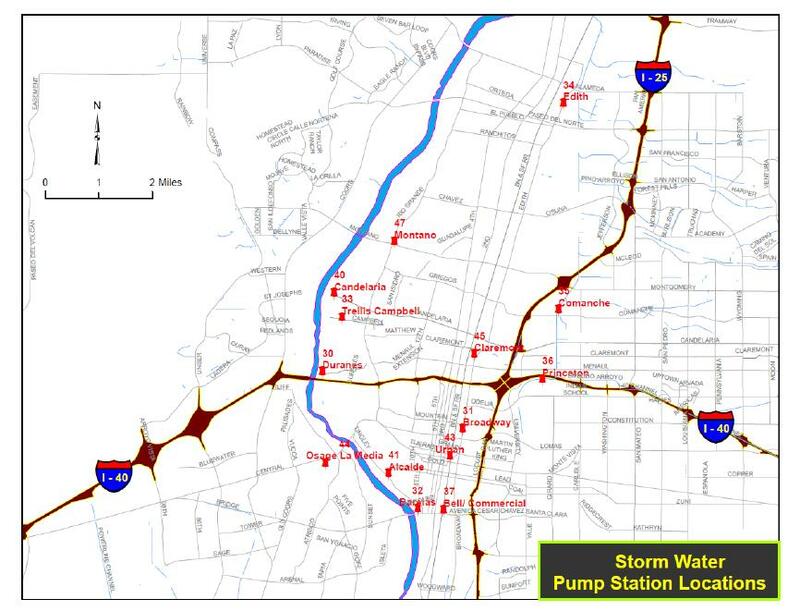 View larger image of storm water pump locations. View larger image of Albuquerque dam locations. The City currently owns 14 storm water pump stations located within the City limits. The pump stations are designed to convey storm water runoff from low lying areas of the City to adjacent channels and storm drainage systems that eventually drain to the Rio Grande. The City works closely with the Albuquerque Bernalillo County Water Utility Authority (ABCWUA) to maintain and monitor the pump stations throughout the year, and more specifically during the months of May to September, or the regions monsoon season. The City currently owns and is responsible for the inspection and maintenance of eleven (11) dams within the City of Albuquerque, four of which are jurisdictional and under the preview of the Office of the State Engineer. 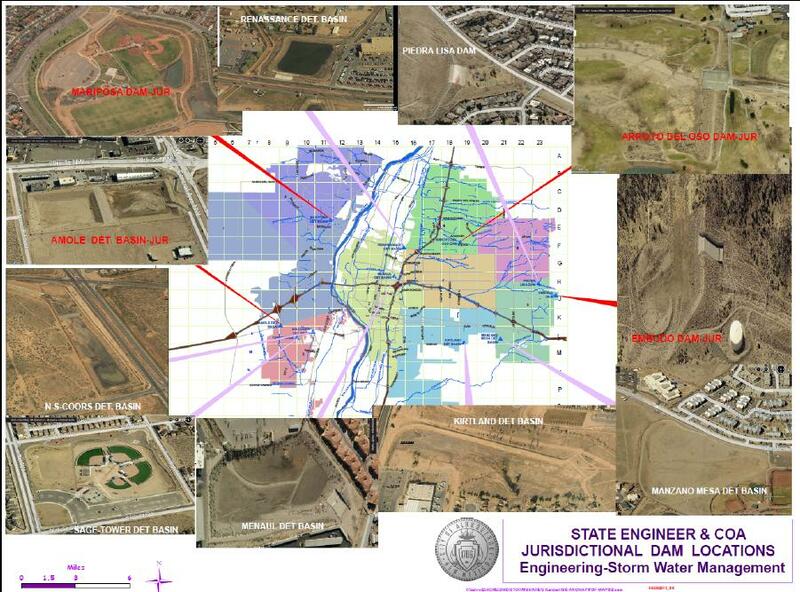 The dams have been designed to protect the lives and property of the adjacent Albuquerque residents and businesses. The Storm Water Management Section of the Engineering Division conducts routine inspections and maintenance activities on an annual basis. Any necessary maintenance needs are conducted by the Department of Municipal Developments Storm Drainage Maintenance group or outside contractors. Protection of our river and improving our storm water quality is of paramount interest and a priority to the City of Albuquerque and the citizens that we serve. As a result the City has applied for and received from the Environmental Protection Agency (EPA) a Phase I Municipal Separate Storm Sewer System (MS4) Permit. It is through the MS4 permit that the City monitors the quality of the City’s storm water runoff to the Rio Grande. The City has also partnered with local agencies within the Metropolitan area to provide information to the public through an effort known as the Middle Rio Grande Storm Water Quality Team or www.keeptheriogrand.org. It is through this collaborative effort that media campaigns are funded, educational programs are organized, and fliers are published. Read about the Municipal Separate Storm Sewer System. View Public Planning resources for the MS4 General Permit. View Private Planning resources for the MS4 General Permit.